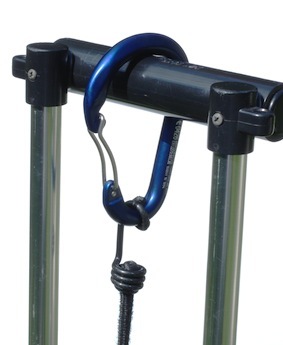 Have you ever used the popular TriKart folding hand truck and had the hook on the bungee cords snag on just about everything? Has it ever let go of what it was supposed to stay connected to? The stock hooks seem to hold onto everything except what you want them stay on. After years of aggravation the hooks on the cart were replaced with these carabiner clips. This modification is safer too since an open hook won’t come snapping back at you if it accidentally released. That’s because these clips have a spring-loaded arm that closes across the open gate. The inspiration was the fact that the stock hooks would snag on just about everything in the vicinity including cables, the undercarriage, and shoe laces before you could stretch it around your gear and clip it near the top of the cart. Sometimes the hooks wouldn’t stay secured dangerously snapping loose and releasing the cargo. Stories of a flying hook gouging out someone’s cheek were horrifying and this was not to happen to anyone. Any operation that uses these model of carts should seriously consider making this modification. It is primarily a safety issue but it also makes using such a cart a lot less of a nuisance. 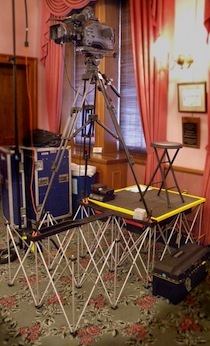 Designed and built the Glissade®, a one-meter long camera slider. This will give ability to create subtle dolly moves. The unit is portable and easy to setup. A simple way to significantly improve production values.